The NOI Club’s second event of 2017 took place on February 21st. On top of having an excellent turn out and being an inspiring evening for all, the main purpose of the event was to provide entrepreneurs in the NOI Club with feedback on their businesses & products. Advice was not solely provided for the ladies who presented, but the overall goal was for all of the ladies to make connections that would assist them in achieving their personal or business goals by the end of the event. A network event with a bonus, and so, NOI’s “Work Net” event was born! Liyun Ye, of Cup and Cone Ice Cream. She creates homemade ice cream with quirky flavours like “Guinness and Cocoa”, and is looking to break into market places & get feedback on what people do and don’t like when it comes to ice cream. Martina Wierzbicki of Wierz works as an engineer by day, and utilizes Wierz as her creative outlet. Wierz is a cork leather handbag company currently seeking feedback on the bags themselves & tips for funding. Mursal Hedayat spoke on her company Chatterbox, a language learning system that caters to refugees, with a beautiful story behind it. She gave an excellent pitch for the company, and was seeking all sorts of support, from legal to graphic design, for building the company. Louise Graham, a seasoned marketing professional, spoke on her newest endeavor, The Think Collective. A marketing community to bring marketers together & assist others with their marketing needs. - Your story is absolutely essential to tell. It connects your audience intimately and emotionally to both you and your product. Share this on every communication and product. The stories behind Wierz's cork material and Chatterbox refugee conversations were both superb. - Don't be afraid to be unusual. You can capture interest and conversations. 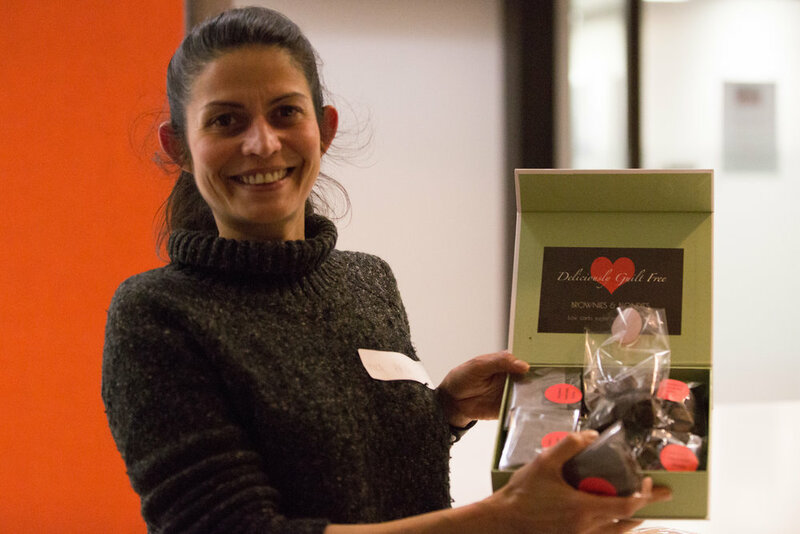 Liyun’s quirky ice cream flavours, and Louise’s story about the disrupting marketing plan she did with peanut butter are both great examples of this. - A pick and mix offering is appealing and a good way to personalise/create a point of difference. (e.g. taking as much or as little as you need from a marketing package, or offering several mini ice cream flavours rather than just one big scoop). The feedback throughout the night made it clear that personalisation is key to a successful product, be it for handbags or ice cream. - Social impact for collective good is a powerful message. Everyone said they would be happy to pay more if the product or service were giving back to the community or environment. Similarly, the on-line platform 'Vested' also rewards new business supporters and customers with a vested interest in helping that new business succeed with equity that pays back later. Lastly, the group would have been happy to pay just to listen to the stories of refugees when it came to Chatterbox attempting to raise funds. Rebecca McKnight is a freelance Product Development Manager specialising in the well-being, gifting and beauty industries. Helping people turn the spark of an idea into actual products, she is a natural innovator with plenty of knowledge about how to get things done.You can find out more about Rebecca here. Her brand new venture in progress is SKINSITIV, providing natural solutions for people with sensitive skin conditions. As a practising Aromatherapist, her life-long love of making healing potions is a perfect fit for this new business.